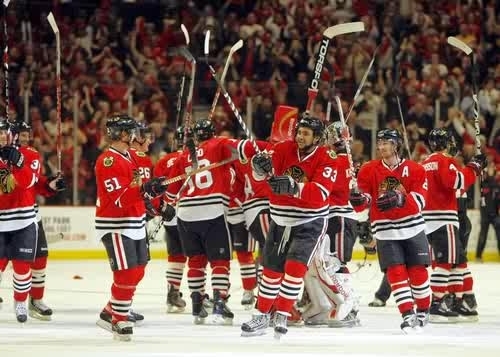 CHICAGO – For the first time in 77 years, Chicago Blackhawks fans saw their hockey heroes win the Stanley Cup on home ice. The Blackhawks won their third Stanley Cup in six years with a thrilling 2-0 Game 6 victory over theTampa Bay Lightning on Monday night, the first time since 1938 that they captured a championship in Chicago. Star winger Patrick Kane had a goal, his first of the Stanley Cup Final, and an assist on defensemanDuncan Keith‘s goal to fuel the victory. Goalie Corey Crawford was stellar with 23 saves, winning his fourth game of the Final in which he surrendered one goal or less. It was his second shutout of the playoffs. Keith the tireless defenseman, who broke 700 minutes played in the postseason during the game, opened the scoring with a brilliant individual effort in the second period, his third of the postseason. After the teams traded chances in a spirited second period, Keith finally broke through at 17:13 to give the Blackhawks the lead. Brad Richards got the play going with a pass to Patrick Kane on right wing. He stopped at the top of the attacking zone, allowing Keith to enter with a head of steam. Kane fed Keith, and the defenseman fired the puck through Cedric Paquette, using him as a screen. Lightning goalie Ben Bishop made the save, but left the rebound, assuming Keith would not be allowed to get to the net. But he blew past Paquette, Andrej Sustr was caught flat-footed near the crease, and Keith put the puck over Bishop’s glove to score the game’s first goal. Kane scored his 11th of the postseason, and first goal since Game 6 of the Western Conference Final, on a great passing play between Brandon Saad, Richards and Kane, the latter two connecting on one-timer at 14:46. For Kane, who had three assists in Game 7 of the Western Conference Final, it was another moment in which a seemingly dormant star ignited at the right time. The first period saw the Blackhawks earn two power plays, and have golden chances to score on both. With Cedric Paquette in the box for tripping, Marian Hossa flipped a pass in front of Teuvo Teravainen, whose tip shot was saved by the toe of Ben Bishop. Patrick Sharp waited by the post but couldn’t get a stick on the trickling puck. Later, with Brian Boyle in the box for roughing, a 2-on-1 down low between Patrick Kane and Jonathan Toews resulted in Toews nearly sending a puck home with the shaft of his stick on the ice. The Lightning also had a close call, as Steven Stamkos rung the puck off the crossbar with about 12 minutes left in the period. The Lightning, as they did all series, played valiantly, going shift-for-shift with the Blackhawks in a tight game. But in the end, the Blackhawks captured four of them; and, in the process, estalblished what’s as close to a dynasty as we’ll see in a salary cap era. The Blackhawks’core — Jonathan Toews, Patrick Kane, Marian Hossa, Patrick Sharp, Duncan Keith and Brent Seabrook — may not get another chance at it due to salary cap constraints. But for now, they’re head-and-shoulders above the rest of the NHL: Clutch veteran leaders who proudly raised a third Cup together in front of the fan base they helped expand and captivate beyond anyone’s imagination.